Join us for an evening of design inspiration with Cheryl Eisen, founder and CEO of the trendsetting interior design and marketing firm Interior Marketing Group (IMG). Using two Room & Board rooms as her canvas, Cheryl will show you how to transform a space with decor and answer your questions about home design. Enjoy live jazz, sips and snacks from Poppy’s and enter to win a $500 Room & Board gift card to refresh your home for spring. Presentation begins at 7:30 p.m.
Room & Board New York City encapsulates everything we love about the city: it blends a bit of everything, displaying modern furnishings and unique home decor items all in one of New York's renowned neighborhoods. 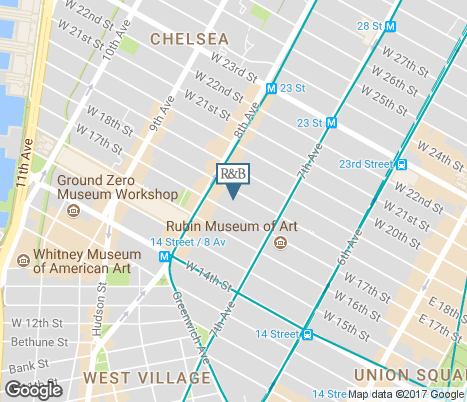 Our modern furniture store is in Chelsea, home to the High Line and a mix of retailers, restaurants and contemporary art galleries. The building, originally the Siegel Cooper Company warehouse that dates back to 1902, is one of the largest Room & Board stores in the country so inspiration for every room of your home is endless. Not only are our Design Associates experts at furnishing city apartments, condos and nearby homes, but they're actively involved in the community. Our team proudly supports the Ali Forney Center, a nonprofit organization that serves LGBTQ homeless youth. It's easy to feel the passion this team has for creating beautiful, welcoming homes. Fast Company took note and named Room & Board a Most Innovative Company in retail in 2019.